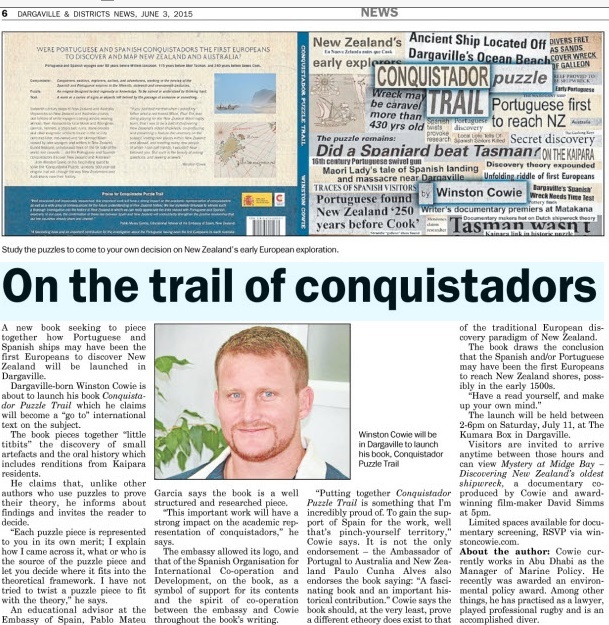 Conquistador Puzzle Trail by New Zealand Author Winston Cowie will be launched at The Kumara Box in Dargaville, New Zealand on Saturday 11 July 2015! Drop in between 2-5pm, grab a book, get it signed, and for those that RSVP and grab a book, a showing of David Sims and Winston Cowie’s documentary ‘Mystery at Midge Bay’ will screen between 5-6pm. 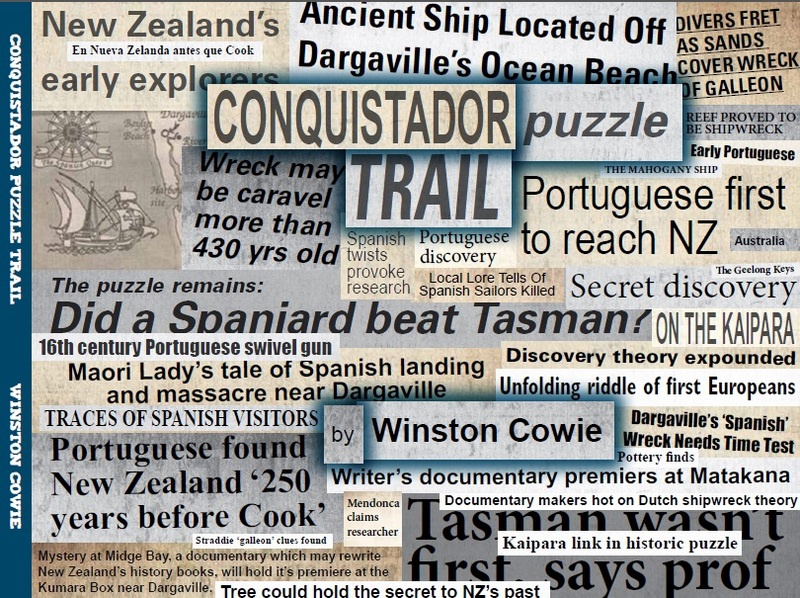 Praised by both the Portuguese and Spanish Embassies to New Zealand, Conquistador Puzzle Trail is a comprehensive assessment of potential pre-Tasman Portuguese and Spanish discovery voyages to Australia and New Zealand. Conquistador Puzzle Trail is the new and current ‘go to’ international text on the subject that the Portuguese and / or Spanish may have discovered Australia and New Zealand. It also presents details of New Zealand’s ‘oldest’ shipwreck, a likely Dutch vessel. Everybody has heard little tidbits about the Conquistador Puzzle whether it be about alleged caravels wrecked on Dargaville’s coast; ‘Spanish’ helmets being found and reburied on the Pouto Peninsula; oral tradition of sailors coming ashore and being massacred by Maori or Aborigines; pohutukawas on the far side of the world; or the Napier Broome Bay cannon or Mahogany ship in Australia, to name a few. Conquistador Puzzle Trail takes the reader through each puzzle piece, puts the arguments for and against its antiquity to the reader, and encourages the reader to decide what part of the Conquistador Puzzle that piece forms. Each puzzle piece is presented to you on its own merit; I explain how I came across it, what or who is the source of the puzzle piece, and let you decide where it fits into the theoretical framework. If a puzzle piece doesn’t fit, it doesn’t fit; I have not tried to twist a puzzle piece to fit with the theory. Each puzzle piece is what it is and means what it means. All the pieces of this perplexing puzzle, however, should at the very least lead to the reader agreeing that a different theory does exist to that of the traditional discovery paradigm of New Zealand and Australia; that being that the Spanish and / or Portuguese may have been the first Europeans to discover New Zealand. And in my view, the Portuguese, most likely and on the balance of probabilities, discovered New Zealand and Australia between 1520 and 1524. And the Spanish may have also beaten Abel Tasman between 1576-1578. In saying that, it’s not what I think that is important, its what you, the public, thinks about the theory that is important. I’ve merely had a go at putting together the puzzle based on best available information. Have a read and form a view! Conquistador Puzzle Trail by Winston Cowie has been praised by both Spanish and Portuguese Embassies to Australia and New Zealand. At the same time, we would like to acknowledge all of the time and energy devoted to the research that has gone into this investigative work. Throughout the pages, we discover new elements of New Zealand culture and history that invite us to truly believe that Mr Winston Cowie’s theory is correct. Author’s Note: The Embassy of Spain to New Zealand has been fantastic and their cooperation and collaboration has been gratefully received by the author. I feel incredibly proud to have the permission to include both the Embassy of Spain to New Zealand and the Spanish Organisation for International Cooperation on Development logos on my book. Finally, this is a real community story for Dargaville, the Pouto Peninsula and Kaipara Harbour. I interviewed many elderly locals who independently had interesting stories to recount. It’s a local community story written by a bloke who was born in the area, but it also has global significance – i.e. we need to consider that another theory exists on the Australian and New Zealand discovery paradigm. Please, come down between 2 and 5pm on Saturday the 11th of July, say hello, and get involved in what will be a lovely community event. Stay tuned for updates on what stores and online outlets Conquistador Puzzle Trail will be available in. See you in Dargaville at The Kumara Box!